Make no mistake, cancer is a serious business. It’s an insidious disease that manifests in countless ways, and for which we still have no cure. We can board a plane and be in New York in less than half a day. We can fly to the moon. We can send messages across the world and have a response within minutes. We can take high-quality images with our phones. We can talk to our mates in another timezone through our computers and see them talking back at us on the screen. We even have cars now that know how to park themselves (apparently). But cancer… still no cure. Again, I say, it’s serious business. Chemotherapy is not fun, trust me. But my very first session – six or seven hours on Friday 25th July last year – gave me an opportunity to, well, if not laugh out loud, rather smile inside at the absurdity that life sometimes hands us. The lovely Zimbabwean nurse assigned to me (yes, wasn’t that a good sign? to have a fellow Zimbabwean look after me) talked me into trying the ‘ice cap’. 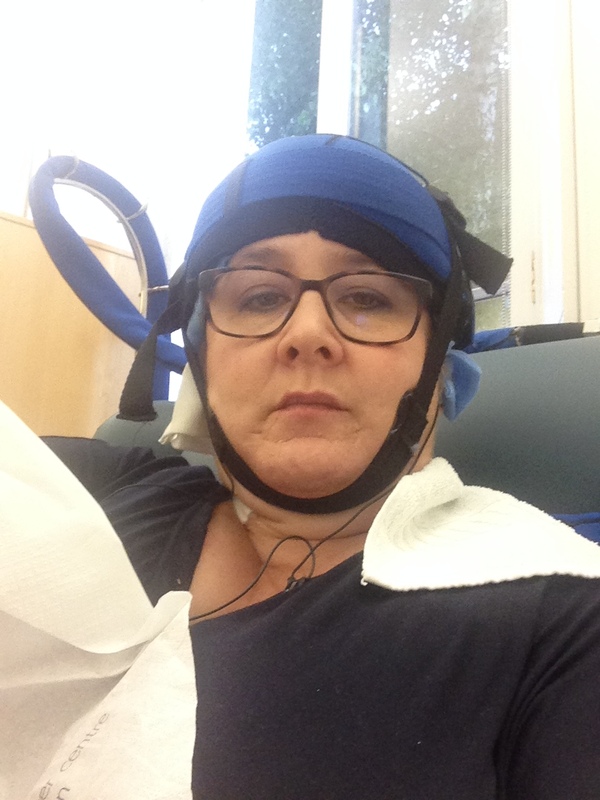 This contraption helps many chemo patients hang onto their hair by cooling the head and roots of the hair to sub-zero temperatures. I don’t know enough about the science, but it works for some people although there are no guarantees. Not NASA’s newest weekend wear for the aspiring female astronaut! No, just the selfie I took while gritting my teeth through the nausea, pain and cold of the ice cap. Anyway, to Thembi’s suggestion I said, “Yes, why not?”, whereupon she wheeled a refrigeration box over to my couch, strapped me into the cooling helmet and told me to sit tight and grit my teeth through the first 20 minutes, after which the discomfort would ease. Right. Piece of cake…. Or maybe not so much! Imagine doing a headstand in deep snow and holding the position…. for HOURS! The helmet is tight, constricting and you get brain freeze and it’s so cold, it actually hurts. Which is why I look so pissed off in this photo.